Photo courtesy of Joe Galván of San Leandro, California. Joe’s mother performed on the program announced on the handbill. 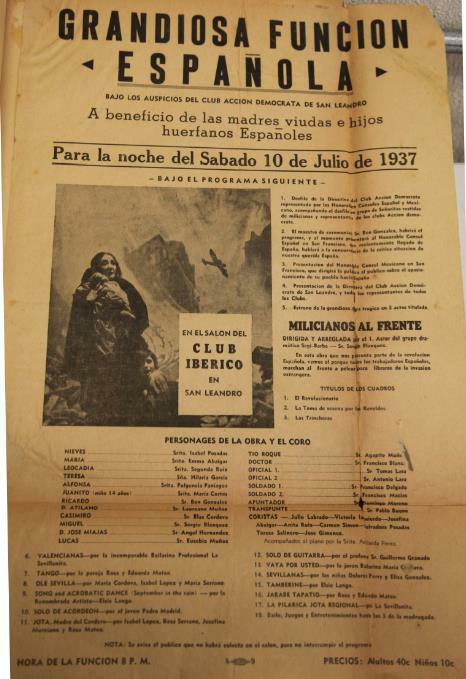 In this fascinating and complex document, the Spanish Consul in San Francisco reports back to the Ministry in Madrid on how the Spanish enclaves in California are reacting to the war in Spain. There are some apparent typos and some convoluted turns of phrase that occasionally blur the intended meaning; we’ve done our best to translate the document. The bottom line: in the US as in Spain, support for the Republic was diverse and often divided. I am honored to respond to the Circular 1762 dated July 13. The American Associations to Aid Spain in California have the same names and affiliations as in all of North America. They are the North American Committee and the Medical Bureau to Aid Spanish Democracy. With regard to the associations in California, I only should note that since the beginning of the year the North American Committee has been subordinated to, and practically dissolved into, the Medical Bureau, which name, thanks to the tact and prestige of Doctors Eloesser and Addis, has prevailed. The North American Committee, or, rather, its Executive Committee tried at the beginning to disseminate propaganda among the Spanish colony, but they had a difficult time because they didn’t speak the language, and the end result has been the recruitment of roughly one hundred members for the American Communist Party. The Spanish Societies that aid Spain in California are divided into two groups: the Democratic Action group, and the Antifascist group. The Democratic Action groups are made up of Spaniards. They have a patriotic and democratic character. Their name comes [¿not so much?] from the unconscious influence of the propaganda campaign, but from the re-election of President Roosevelt, which came about just as the organization was forming. They raise funds through voluntary contributions, public events, excursions, dances and lectures. They sent the money they collected first to the Spanish Embassy and, after the law of neutrality was adopted in this country, to the Central Committee to Aid Republican Spain in Washington. The Acción Demócrata societies that have maintained this spirit are those of San Leandro, Sunnyvale, Sacramento, Mountain View, Santa Clara, South San Francisco, Hollister, and the Club Recreativo Español de Wilmington. Among the organizers of these associations in the countryside, the following deserve special mention because of their activity and consistency: Luis Puente of Sacramento, mechanic; Sebastian Walias, of Sunnyvale, farmworker; Juan Domingo, of Mountain View, laborer; Antonio Toledo, of Santa Clara, farm worker; and Sergio Blásquez of San Leandro, mechanic. They have all been in America for a long time, and their reaction to the Spanish tragedy is patriotic and working class; with regard to Spain, they do no promote a specific political line. In San Francisco, whose Acción Demócrata was the original and the organizer of the rest, they have been going through a crisis that has resulted in the loss of their original founders and which has given rise o the presence on the board of people subject to the influence of the SIA [Solidaridad Internacional Antifascista], with some communist elements. Before, it was like the ones from the countryside that we’ve talked about; today, they don’t have a definite political line either. To date the funds they’ve raised have been sent to the Embassy and to the Central Committee in Washington. This entry was posted in California and tagged Antifascist Group, California, Democratic Action, Miguel Pizarro, San Francisco, Spanish Consul. Bookmark the permalink. It seems that they were sympathetic to the anti-fascist activity, if I am not mistaken. Damned if they did and damned if they didn’t! Unfortunately our families had two unpopular groups to support in this terrible Civil War that killed a million of our people. Support the current government and you supported the Communists and if you supported the Fascists you supported the infamous Generalissimo Franco! A no win situation! Thank god my family immigrated to the U.S.A. We are so blessed to be here in the U.S.A.